Over the past century, luxury has been increasingly celebrated in the sense that it is no longer a privilege (or attitude) of the European elite or America’s leisure class. It has become more ubiquitous and now, practically everyone can experience luxury, even luxury in architecture. Focusing on various contexts within Western Europe, Latin America and the United States, this book traces the myths and application of luxury within architecture, interiors and designed landscapes. Spanning from antiquity to the modern era, it sets out six historical categories of luxury - Sybaritic, Lucullan, architectural excess, rustic, neoEuropean and modern - and relates these to the built and unbuilt environment, taking different cultural contexts and historical periods into consideration. It studies some of the ethical questions raised by the nature of luxury in architecture and discusses whether architectural luxury is an unqualified benefit or something which should only be present within strict limits. The author argues how the ideas of permissible and impermissible luxury have informed architecture and how these notions of ethical approval have changed from one context to another. Providing voluptuous settings for the nobles and the leisure class, luxury took the form of not only grand palaces, but also follies, country and suburban houses, private or public entertainment venues and ornate skyscrapers with fast lifts. The Architecture of Luxury proposes that in Western societies the growth of the leisure classes and their desire for various settings for pleasure resulted in a constantly increasing level of ’luxury’ sought within everyday architecture. Contents: Preface; Introduction; Sybaris as a marker of luxury; Lucullan luxury; Architectural excess; Luxurious spaces and the rustic; NeoEuropean luxury; The dispersal of modern luxury; Epilogue; Bibliography; Index. 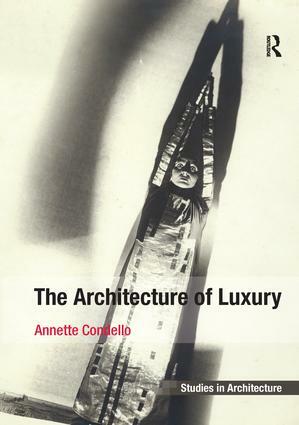 Dr Annette Condello is a Lecturer in Architecture at Curtin University, Australia.